New research published in Cell Reports identifies a potential treatment target for blinding diseases such as retinitis pigmentosa and advanced dry age-related macular degeneration. In the study, researchers at Washington University in St. Louis School of Medicine (supported in part by an unrestricted Research to Prevent Blindness grant to the Department of Ophthalmology) explored how the retina’s photoreceptors — the rods and cones responsible for detecting light, color, contrast, and sharpness — are damaged over the course of these diseases. 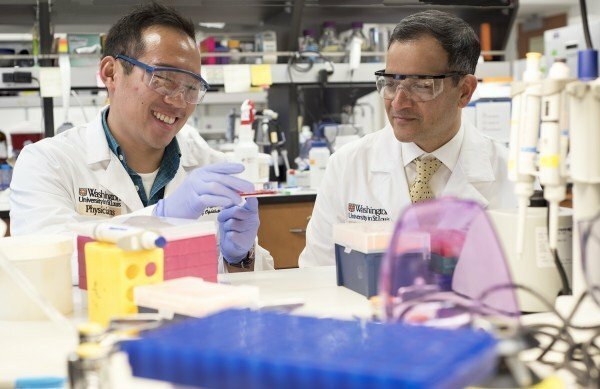 MD/PhD student Jonathan Lin (left) and Rajendra S. Apte, MD, PhD, of Washington University School of Medicine in St. Louis. Lin works in the laboratory of senior investigator Rajendra S. Apte, MD, PhD, the Paul A. Cibis Distinguished Professor of Ophthalmology and Visual Sciences, who is a recipient of an RPB Physician-Scientist Award and also recently published key findings on the Zika virus. In a series of experiments in mice and retinal cells, the researchers identified a key molecule — NAD — in the cascade that leads to the death of the retina’s rods and cones. Lin, Apte and colleagues found that defects in the same NAD pathway appear to be involved in several different diseases of the retina. When they treated damaged photoreceptor cells in mice with a second molecule called NMN — a precursor molecule that boosts levels of NAD — the cells’ degeneration ceased and vision was restored. “This is exciting because we may have found a reason why these highly metabolically active cells are susceptible to damage and death when the NAD pathway does not function optimally,” said Apte, also a professor of developmental biology and neuroscience and of medicine. The pathway offers a promising target for therapies for multiple retinal diseases, including retinitis pigmentosa, a cause of blindness that impairs vision over many years and for which there is currently no cure. Source: Research to Prevent Blindness.